Melamine Edging is an ideal way to finish the exposed edge of Melamine faced MDF, chipboard or other panels. Used extensively in the manufacture of kitchens and home & office furniture, it is a specialist resin-saturated paper which is lacquered to give it resilience. 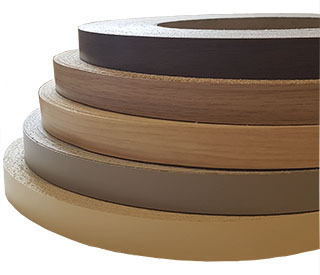 Melamine Edging is available in a wide range of colours and wood effects. Offered in pre-glued, easy to iron on, and some un-glued.